This letter is dedicated to every woman that I have come across and they have given me hope and motivation in someway or form. To the women I know in real life, met on social media or never even met just came across your story. I appreciate your efforts, hard work and contribution to the betterment of society. No need for cliches but you are PHENOMENAL. Even on your low days you are unbothered by it all for you know not all days are sunny and glamorous, you are so understanding, caring and kind. Oh strong woman, how you balance work life, family life and social life amazes me. Thanks for showing me that the world has no limitations for us being leaders, mothers and wives all at the same time. How you tackle the job/ career that was once known as a “man’s job”, and doing it all while PMS-ing, on your period, pregnant, or in heels. Just all things a man could never experience empowers me to continue working hard on my journey and that giving up is not an option. Strong woman thank-you for showing me that resting to rejuvenate, self care, self love and time for self is always an important factor in success. Strong woman you are beautiful, elegant & powerful. Independent woman, I truly admire you. I am happy I came across you. Keep going, you are enough. I am here to remind you that your hard work, discipline and determination will not go in vain. For you are a strong believer in God & the universe. Whatever you want in life, the universe will conspire to help you get it and God is your backbone, he is there to lift you up when you are low, he is there to wipe those tears that you oftentimes shed, he is there to remind you that happiness comes but some days it goes dark and you are left there, but your heart, your heart is strong and it illuminates light and positive energy that is helping you through your struggling twenties. You are loving your struggling twenties and the fact that you have to work for what you want, makes you happy. You are learning to build from the grung up because you want whatever it is, to last and to have a true appreciation for it. Continue to allow the memories of your dad help guide and push you. I am patiently waiting for #Glory30s. We all have those days, we all have challenges and it is our responsibility to tackle our days and emotions accordingly. 2. 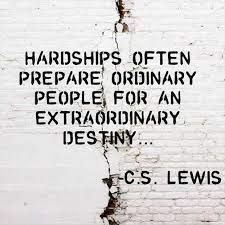 You have had challenges before and overcame them. 3. Rome was not built in a day. – Things take time. -Be patient. 4. Things will change & nothing lasts forever. 5. Loving yourself, making yourself a priority and knowing you are enough will take you a far way. 6. Difficult times comes with experience, growth and many lessons.- Look on the bright side. 7. Be happy. -Live in the moment and have fun. 9. Spread love and kindness everywhere. – You never know what storm someone else is facing. 10. YOU WILL BE STRONGER & WISER. This picture is not owned by me. I extend credit to Pinterest.